How should I fix this? I very much doubt this is the cause of the problem. Even if you are using a very old version of Chilkat, that should've supported at least TLS 1.0. The latest version of Chilkat would by-default use TLS 1.2, and would certainly not try to use RC4. Turn on verbose logging and check the contents of the mailman.LastErrorText. Hi the version I get from ShowMessage( mailman.Version); is 6.0.0. Is that recent enough? The result from mailman.LastErrorText is the screenprint in my first post. And how to turn on verbose logging? I'm using chilkat with Delphi 2010. Ancient, so to old to support TLS 1.0 or TLS 1.2? Isue is fixed with using version 9.5. 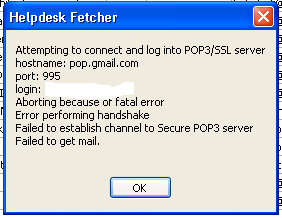 How to Access Junk/SPAM Folder via POP3? Download email from Yahoo Mail? Download attachments in using POP3?